Sigma 30mm F1.4 EX DC HSM lens introduction: Sigma Corporation is pleased to announce the launch of the new 30mm F1.4 EX DC HSM lens. 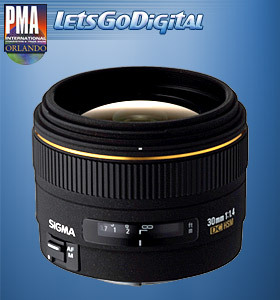 This large aperture Sigma 30mm F1.4 EX DC HSM lens is designed to match the APS-C size image sensors of digital SLR cameras. Two SLD glass elements are especially effective in the compensation of magnification chromatic aberration. Glass mold aspherical lens at rear group of lens reduces color aberration and provides high-quality image results. From 40cm (15.7") minimum focusing distance to infinity, this lens creates very sharp images with high contrast. The HSM models provide quiet high-speed auto-focus shooting, as well as full-time manual focus. Large maximum aperture of F1.4 can perform superbly in a great range of applications, including snapshots, portraiture, indoor shooting and landscape photography.